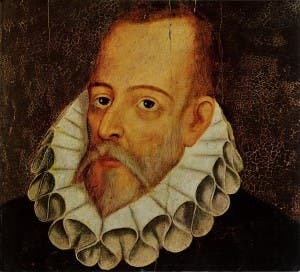 HIS most famous character embarked on an epic journey around Spain, and it has now been revealed that Miguel de Cervantes also enjoyed a spot of travelling. In fact, new research has tracked the 16th century author’s own Don Quixote-esque voyage of Andalucia. Researchers linked Cervantes to visiting no less than 28 towns and cities across the region. From Alora and Ecija to Velez-Malaga and Teba, Cervantes’ journey took him to the farthest-reaching corners of the south. And while his famous character’s journey had no real purpose, Cervantes’ travels were far more practical. A taxman by trade, he travelled the region debt-collecting for the government. But he also had time to enjoy himself, visiting iconic landmarks such as the Alhambra. In a new exhibition at the National Library in Madrid, researchers used letters sent from around Andalucia in the 1590s to mark the author’s journey. His stop-offs included: Almanzora, Alora, Arahal, Baeza, Baza, Carmona, Castro del Rio, Ecija, Estepa, Granada, Guadix, Jaen, La Puebla de Cazalla, Lopera, Malaga, Marchena, Medina Sidonia, Montilla, Moron de la Frontera, Motril, Palma del Condado, Paradas, Ronda, Sevilla, Teba, Ubeda, Utera and Velez-Malaga.